I finished my tenth marathon, the London marathon in 5:01:05. 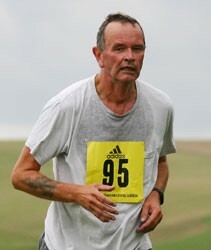 This is my worst time for London, and I have even run the much tougher Beachy Head course in faster times. On the other hand, I have now run ten marathons and, as I am not getting faster, I am going to stop at ten. I shall continue to enter shorter races, half-marathons, 10ks, ten milers and maybe the odd twenty, the next fixture being the glorious Seaford half. The crowd support all the way round is so impressive. That strangers should stand there and shout encouragement at me never ceases to surprise me...and the bad pub rock bands playing covers, the people in deck chairs and picnics, the pubs packed to the rafters with supporters, all contribute to an atmosphere I have never experienced anywhere else. I was more conscious of the cheers when walking than when running, but maybe that's because I'm moving more slowly. They are prone to hyperbole of course: the man who yelled at me 'Tom, you're a hero' was possibly overstating the case. I tried repeating to myself some of the incantations that the motivational speakers suggested at the marathon expo. I fear they failed, but I'm not much of a man for motivation. I caught the Seaford Striders coach at 6 in the morning at the station. The organisers, Bill and Glynis Young , did a splendid job, decorating the coach with posters wishing us good luck and, on our return, congratulating us on our achievement, And there were some achievements: when I came upon the striders outside the South Bank, several could boast of personal bests. Our best result was Geoff Gray who managed 2:49:47, followed by Philip Carr and Dave Dunstall at 3:07:22 and 3:07:26 respectively. First woman Strider home was Natalie McCreath at 3:43:35 followed by Fern Ketley at 3:55:26 and June Streeter at 5:17:59. We reached Blackheath with plenty of time to spare, so I took my time, drinking some water and a gel, changing in the changing tent with the scent of Vaseline and Ralgex in my nostrils and negotiating the complicated queue for the urinals twice. But I think there was some underlying panic: I carefully packed all my clothes away in my kit bag and handed it in to the baggage lorry, then realised I had left the timing chip in its envelope in the bag. I rushed back to the lorry and pleaded to have my bag back , which they kindly gave me. I put my glasses on to fasten the chip to my shoe with the adhesive strip provided, packed my bag again and handed it in. I walked away and discovered I was still wearing my spectacles, which I never wear while running. I didn't dare ask for my bag back again, so ran with my specs stuffed down my shorts. Afterwards, I made my way across the Thames to the South Bank. There I lay in the sun outside the Royal Festival Hall. There were half-naked runners, skaters making the most of the South Bank ramps and, in the midst of this disorder, a red carpet, security men, journalists and a scattering of fans waiting for minor celebrities to arrive at the Royal Festival Hall for the television BAFTAs. The bald facts first: I finished in 4 hours 28 minutes and 12 seconds. My splits, at the end of this account, show a reasonable first half, but that I failed to keep up the pace in the second. My average pace was 10.10. I was 18934th overall, the14930th man and came 1099th in my age group. Speaking of age, it seems the 101 year-old was in fact only 94. I slept quite well the night before, only waking when I heard the cat drinking from the lavatory bowl, and after an anxiety dream in which I was late for the start because I was librarian at a rabbinical college, had gone to work before the start, and, caught up in the management of their collection of rare Judaica, had lost track of time. In reality, I woke at 5.30, ate some porridge and toast, then drove to Haywards Heath to catch the train to London Bridge. At London Bridge I had the bright idea of using the loo before catching the Blackheath train; so did several hundred other runners, and we all queued for a single automatic loo, which wasted lots of time, not least because it cleaned itself between each user. I still caught the train to Blackheath in good time to arrive at the blue start with an hour to go. In 2005 I was allocated to the red start; I much prefer the blue. I changed, wandered around a little, watched the elite starts on the big screen and then headed for my pen. I crossed the start line at 9.49, only four minutes after the gun, which is good. I've taken that long to cross the line at much smaller events. Then the long slog down the Highway and round Docklands, through Limehouse and the Isle of Dogs. Up till now I'd felt fine, but now my feet, my left calf and my knees began to hurt. I lost some time when I stopped to take off and adjust my soaked left sock and shoe, so hard to undo. The miles go by slowly in this stretch, ending with the winding bits round Canary Wharf. Then the route turns to the west, at last heading in the right direction for the finish. By Poplar it was very hard, and I'm not really sure how I kept going, except that every runner who has got his far thinks how silly it would be to give up now. On the way back through Wapping, Tower Hill, Lower and Upper Thames Street and the Embankment, I focused on the blue line on the road, which is supposed to indicate the shortest distance. By this stage there are walking casualties all over the place, and I wasted a lot of energy swerving to avoid them. At mile 23 it started to rain again, very heavily, and continued until I reached Parliament Square, but then stopped so I had a dry finish. I collected my bag, and changed by the Royal Artillery monument in St James's Park, and then walked slowly and painfully to Victoria, where I bought a sandwich, and caught the train back. It was a solitary run: I didn't really speak to anyone else, apart from offering some encouragement to the odd runner here and there, including one who asked me in the Upper Thames Street tunnel how much further it was. I hope I reassured him and he managed to finish. London is odd. The crowd support is quite extraordinary. Runners are offered jelly babies, orange segments, even beer by the spectators, just as one might feed zoo animals. I feel ambivalent about this: on the one hand it is impressive that people, some there to support family members or loved ones, some to support a charity, but many without any personal connection to the spectacle, should come and cheer the runners on. Why should they cheer a slow middle-aged man like me? There is an atmosphere of a village fête spread over 26 miles of roadside: the amateur bands, the pubs open early, the banners, the morris men, even bell-ringers, all need the insights of an anthropologist to be understood. For the BBC's, highlights of whose coverage I saw in the evening, the marathon is either for elite athletes, or fund-raisers. There is no room there for the amateur at my level. I don't begrudge the charities the income they raise, and ran for the Blue Cross myself in 2005, but I do wonder. The big charities seem over-slick and PR-directed, while the efforts of the smaller fry to emulate the big fish have a tone of desperation. The fundraising mines the rich vein of mawkishness in the British psyche, and in no case more so than the childrens' charities. I was disappointed with my time. The trend, I'm afraid, seems to be to slow down with age. Though better trained, I was only three minutes faster than my last 2005 London attempt and, leaving Beachy Head out of the equation, I was faster in the Isle of Wight (2006) and the Neolithic (2007), both harder courses. At a conference in London, so my running alarm clock woke me at 615 for a run round Hyde Park, a slight covering of snow and more falling as I ran. Even this early, there were a lot of runners around though rather anti-social ones: few returned my cheery "good mornings", the women looked as if I was going to expose myself to them, the men sized me up as if wondering who would come off best in a fight. There were daffodils and crocuses in places and some horses and their riders. The Round Pond was frozen, though not the Serpentine, and the Albert Memorial surprised me, as it always does, with its gilded brightness.